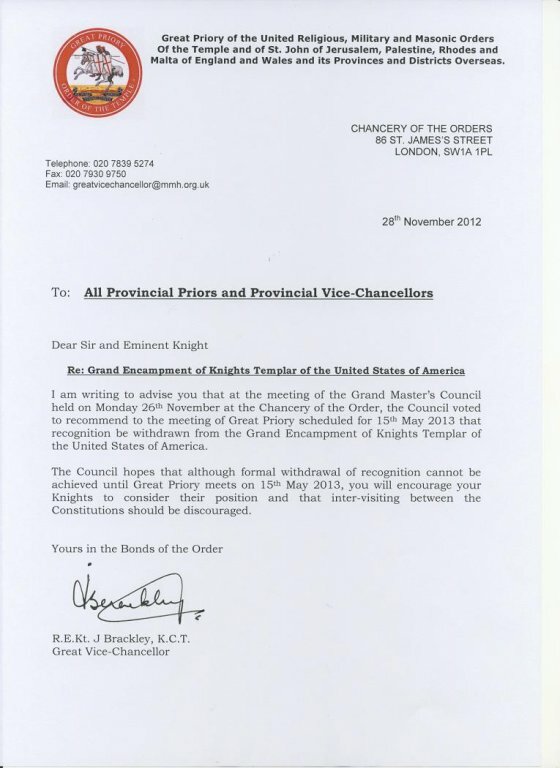 Today I was perusing the Internet when I came upon an article on the Masons of Texas forum that displayed a letter from the Great Priory of England that proposes a meeting be held on May 15th, 2013, that recognition be withdrawn from the Grand Encampment of Knights Templar of the USA. It doesn't state the reason for why they want to remove recognition, but it most likely revolves around the creation of the Grand Priory of the Reformed and Rectified Rite of the United States of America. It will be interesting to see where things will go from here and how the Grand Encampment will respond. The Most Eminent Grand Master has some difficult decisions to make that will affect the future of the organization. I doubt there will be a solution that will please both sides of the issue.